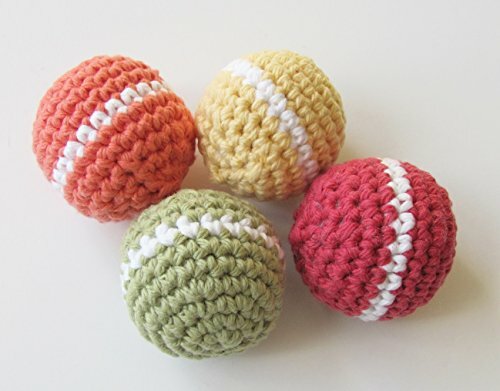 These toy balls are perfect for small dogs, who are not power chewers, and can provide hours of fun and exercise, as well as helping to contribute to your pet's dental hygiene. As your pet mouths the toy, the cotton gently cleans the teeth and gums, helping to reduce tarter and plaque build-up, which can lead to gum disease. Great choice for small dogs or cats who prefer a toy that doesn't squeak! Stuffed with pet friendly, non-toxic, plant based PLA Fiberfill. Balls measure approximately 1 1/2" in diameter. Colors may vary. Can help contribute to your pet's oral hygiene! If you have any questions about this product by K Farms Natural Gifts, contact us by completing and submitting the form below. If you are looking for a specif part number, please include it with your message.